The MCS front-office platform includes built-in manage-to-model functionality which allows to link multiple accounts to portfolio models and manage them at the aggregate level. Available portfolio models include professionally managed strategies ranging in their risk profiles from Income to Growth-Plus. In addition, our platform allows advisors to create and manage their own portfolios – with our support. MCS provides a wealth of security-level data and portfolio-level information to facilitate investment decision making. It automatically loads account data from your custodian/BD platform* such as TD Ameritrade and Charles Schwab (after initial approval and set up), and price data from our providers including the NASDAQ and Quotemedia. 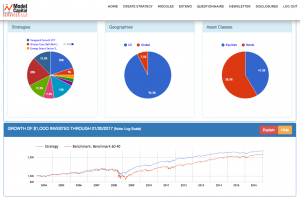 Portfolio information includes asset, geography and sector allocations, return measures, risk measures (volatility, beta, drawdown, risk profile, etc. ), and risk-return metrics (Sharpe, Sortino, Information ratios, etc.) Performance is presented over multiple periods, with interactive historical graphs, and compared to benchmark. As a result, you have a better and more accurate way to present and manage your client assets. Other productivity-enhancing tools – such as comparing accounts to models and creating family groups – further enable you to spend more time gathering assets, and less time manipulating data. MCS includes several rebalancing methods (for example, reset to initial weights or minimize volatility), frequencies, and trading cost-minimizing options which can be saved with each portfolio model. These instances of portfolio rebalancing, account deposits/withdrawals, and discretionary investment decisions generate proposed trade lists. Through a single interface, you can quickly review the entire trade list, and release trades to your BD/custodian for execution. * Our platform is currently integrated with the following custodians: TD Ameritrade, Charles Schwab, Trust Company of America (TCA), and Interactive Brokers.